Brian Goldstein wins a spot in the 2008 U.S. Junior Invitational Closed via his win on tiebreak over Edward Lu in the U21 section of the U.S. 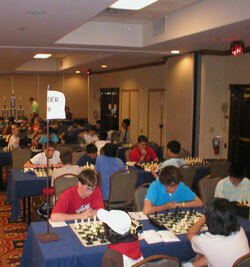 Junior Open (Tampa, Florida June 22-24.) Meanwhile, Miguel Fonseca wins Under 16, HaoQing Wang and Jared Lassner win Under 12, and Miguel A. Hernandez takes Under 8. The players stopped recording moves after 31...Qb3 due to time pressure.Goldstein doesn't remember the rest of the game though he told CLO that he thought he was already better after 31...Qb3. White's main shot is to find a perpetual- if he doesn't, he'll certainly be worse as Black's knight will reign over White's bishops in this structure. Miguel Fonseca (1594) won clear first in the Under 16 section with 5.5/6. Here is his win over the top seed and second place finisher, Lucas Van Beuzekom (1859). In the Under 8 section, Miguel Angel Hernandez scored a perfect 6-0!